It’s a new look, and a new model, but now the No. 88 has a new driver. Yet, it’s a familiar result at Dytona. DAYTONA BEACH, FL — Ah yes, the time of year for the next sport has come to fruition. In February, one ends, and another begins. Although even a week removed from what is to be thought of as the biggest celebration of PA sports success since the last Stanley Cup victory by the Pens last year, the next “Super Bowl” of a different kind takes shape come next weekend for NASCAR. This is the only sport where the biggest race is the one that starts the year, and it makes for a lot of pressure for everyone, no matter how many years a driver competes. So imagine the pressure of a complete rookie who has only substituted in Cup competition on occasion, to be the one tabbed to take over the car that for 10 years was piloted by the driver that fans revered for over two decades because of his name, and his father. Alex Bowman had to be feeling the weight of the entire planet on his shoulders when he stepped into the role as a full-time driver this year. He’s the young rookie that is taking over the No. 88 Chevrolet of the sport’s most popular driver dating back to the mid-2000’s, Dale Earnhardt Jr. 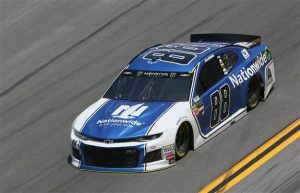 Bowman was the man Rick Hendrick decided to take over the car, with input from Junior himself, and considering how he performed in the car while Junior was recovering from his concussion two years ago, it seemed like a natural choice. No one knew if having the full-time ride would be a task that he possibly could not handle, because the fans were uncertain of what to think of the driver. They knew the crew had all the tools to provide the best car each week, but he was the only uncertain factor. So how does one erase the ones questioning the choice? It certainly helps by having the fastest car in both the first qualifying session for the sport’s biggest race, and then follow it up in the second round by officially winning the pole for the Daytona 500 in his first attempt at the race. Bowman was quick once he got out of the car, although being able to joke about it as well, in saying “All I did was drive.” But he is right, the crew set up the new Camaro ZL1 with some excellent power, and downforce, to get to the front of the field. Bowman now needs to finish his Duel race on Thursday in one piece, and without the need to change the engine, transmission, or the rear gear. Otherwise, his pole run means nothing, and he must go to the back of the field. 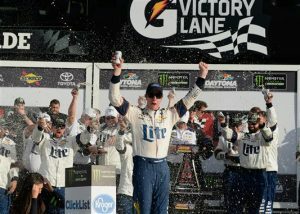 Not for points, but once again Brad Keselowski shows he’s the king of the plate tracks with his Clash victory. Just about half of the field that will take the green flag next Sunday got an early dose of what could come when they competed in the Advance Auto Parts Clash later in the afternoon. Although just 75 laps, the sprint gave a clue into the teams to watch, the strategies employed, and also the overall stance to how the cars will handle the tweaked rules for the plate tracks. What became apparent is that having teammates is the best partnership to have, because these new rules on the cars have made it critical to trust the driver in the mirror. That and trusting the handling of the car has become even more critical. At times in the corners when the pack was moving it was not uncommon to see speeds at over 200 MPH in the draft, and still have power to use. In a way with the new cars hitting the track for the first time, that is a bit spooky, and it’s uncertain if NASCAR will decide on reducing the plate size to lower speeds, or if there will be another way they try to get these beasts to slow down. It is making them unstable at certain points because the leader now, unlike last year, has less time to possibly hold off a fast charging lane, because darting high or low, that means losing handling, and possibly positions. A driver will need to be methodical, and smart, with their moves in order to put themselves in the right position at the critical point in the race. At Daytona, if a car is withing striking distance, it’s a contender. And especially when the trophy on the line is the most prized one in the sport, next to the Monster Energy Championship. Some drivers go their entire career without winning it. Others have done so many times. It’s the most unique race of the year, because one weekend you qualify, then you race just to set the field. That part comes in three days, with the Can-Am Duels on Thursday night. NOTABLE FINISHES: 12-Johnson 14-Truex Jr. CAUTIONS: 2 for 7 laps. Lap 27-29 (25 Lap Segment Conclusion); 35-38 (#1, 41 Incident-T4). LEAD CHANGES: 10 among 7 drivers. A. Dillon 1; D. Hamlin 2-9; C. Elliott 10-14; A. Dillon 15-16; C. Elliott 17-23; J. Logano 24; K. Larson 25; K. Harvick 26-27; B. Keselowski 28-33; C. Elliott 34-38; B. Keselowski 39-75. TIME OF RACE: 1 Hr, 6 Mins, 19 Secs.